Hello and welcome to Updates from the Forge! We've had loads of great stuff happening in the last month, and we've got a good bunch of it for you in this newsletter. In addition to what we've got here, we had the release of the great Tales from Windy Meadow, which is very well worth checking out. We also had a successful Christmas competition, for which the results will be announced soon, and we've started our regular elections so we'll be able to confirm in a week or two how if at all our staff team has changed as a result of those. Now's also a good time to look back at some of Exilian's achievements in 2018. This was the year our community turned ten years old, a big milestone for a little forum-based collective and a testament to all the people who've come to this corner of the internet and decided it looked like a place they could turn into their online home - very, very many thanks to all of you. We had a great anniversary competition too, and a successful chain writing project that created three great stories, as well as a regular run of articles throughout the year. There've been projects published too: Tales from Windy Meadow we've already mentioned, but of course we should also mention Frozen Skies by Utherwald Press and Jubal's Doctor Who themed adventure game LIFE among other very cool releases by Exilian members in 2018. We're looking forward to many more great independent geeky creative things happening in 2019, and we hope you'll be along with us for the ride. This is, sadly, likely to be the last monthly update in the near future after an uninterrupted run of 32 regular monthly Updates from the Forge newsletters - in 2019 we're planning to cut back to doing bi-monthly or quarterly issues. This is as a result of us lacking the staff time to keep producing these newsletters at the current rate, and low rates of readership which aren't justifying the current input. We hope that the time saving here will help us keep up a schedule of article content and focus on running more creative competitions, as well as maybe allowing Jubal to get some sleep on occasion. Sprites from Soundimage? Sounds good! Mastery of Olympus now has a manual - or does it? A new project on Exilian in the last month is Heralds of the Order, a turn based battle strategy game with a deep fantasy setting and a range of scenarios on offer! You can already download an open testing version that pits a range of troops, from blademasters and shamans to monks and spearmen, against a larger enemy force that you must defeat with your wits and cunning. A square tile-based map with a range of different effect patterns for different attacks, plus god powers that can change the tide of battle and terrain bonuses that can shape the ebb and flow of the fight, combine to make a combat system that is driven by the genre's fundamentals whilst still providing a great range of tactical options. The Heralds of the Order team have also posted [img=https://exilian.co.uk/forum/index.php?topic=5836.0]http://one of their first devlogs[/img] on Exilian and are hoping to add more in future, so do go check those out and discuss them further - there's clearly a lot of good stuff still to come on this game! As ever, Eric Matyas continues to add great new free music tracks and images for use by creators of all kinds. His website, SoundImage, is one of the largest centres for such free tracks and resources by a single creator anywhere on the internet. Whether you need a texture for your latest 3d model, a sound effect for your combat mission, or backing music for your YouTube video, there are absolutely loads of tracks, clips and pics to choose from. An additional exciting announcement is that SoundImage will soon be including a new section for game art, including backgrounds and sprites which could be used in various games. This will be SoundImage's fourth major content area, along with sound effects, soundtracks, and textures, and will further improve it as a resource for game designers. As creative resource to bookmark and one that's always expanding, it's second to none. With the release of the Adventurers' Edition of the Savage Worlds RPG system, the Frozen Skies supplements and rulebooks by our friends at Utherwald Press are being updated to take account of the rules and balance changes in those books. The most recent release is the adaptation of the rules for the terrifying Death's Chase air race, a death-defying (if you're lucky) event in which the high peaks and deep valley's of Aleyska's most lawless areas must be navigated by fast-flying pilots. Not only do you have the risk of crashing to negotiate, but on the second and third laps of the three-lap race, planes are allowed to open fire on any opponents in front of them - this may be a race where it very much pays not to be leading the pack! You can read more about how running Death's Chase fared with the new SWADE chase rules here, and find all Utherwald's other posts on their forum. There are plenty of new updates from Fringe Planet, a game in which a small number of individuals find themselves on a lost fragment of rock floating in the void of space. What challenges they face, how they got there, and how they will deal with the eldritch terrors and simple chilling cold of their new world will all be up to you as the player. Recent updates include a lovely dev blog post on Occult Machinery, which will be a key part of the game's technology possibilities. 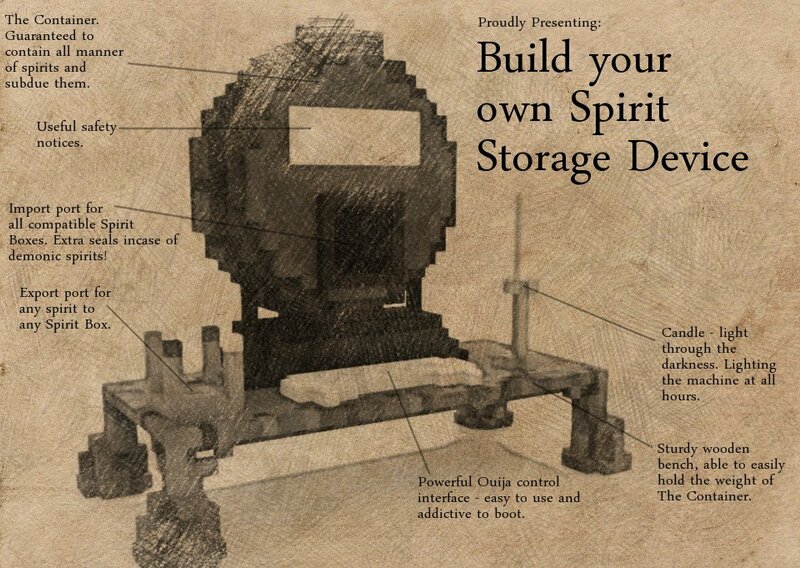 You can box spirits up, store them (as in the somewhat Ghostbusters-inspired storage unit shown above) and ultimately use them as a power source that will keep machines running and - hopefully beyond hope - keep your peons alive in the terrifying wilderness they inhabit. Other recent devlogs include a roadmap of the game's development plans, with a hoped-for release sometime in 2019 which we're very excited about. Do head over to the Fringe Planet and find out more about this great game as it develops! We've recently had a new update from rbuxton, developer of Ancient Greece themed boardgame Master of Olympus, in which the players take the positions of different gods whose followers vie for power hexagon by hexagon across the Ancient Greek world. With mighty god powers, great battles, and monsters to offer, it's nonetheless a game with smooth and efficient gameplay - but how easy is it to write the manual? 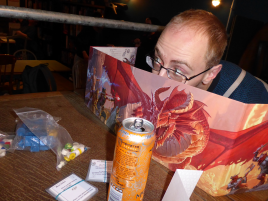 That's the subject of the latest Master of Olympus blogpost, in which we're treated to a developers'-eye view of one of the first blind playtests of the game. Both the successes and the frustrations - people missing the one all-important sentence, or leading 75% of their troops to die in the first winter, but also seeing people getting a handle on the game on their own - are very much evident, and it's well worth a read. It's nearly the end of Christmas (twelfth night is this weekend, and Orthodox Christmas is on January 7th), so we thought we'd share again with you Jubal's rather unconventional Christmas carol which has been posted to Exilian Media, one of our two YouTube channels along with TheExilianChannel. ExilianMedia focuses on talks, music, and productions, whereas TheExilianChannel contains (rather sporadic) news, vlogs, announcements, and other such content. In the Exilian Media archive, as well as singing of the delights of porcupines, there's Jubal's sequence of Game of Thrones songs, fascinating talks from our past conventions, and a range of other music, spoken word, and drama projects. Please do like and share our videos, it means a lot to all of us on the Exilian team! And there we are! We'll see you some time in February or March for the next issue of Updates from the Forge - as ever, we welcome any of your thoughts and feedback and thanks to all of you who read these newsletters. Be creative, be geeky, be welcoming, discover interesting things, and have a wonderful 2019, all of you.